Two kinds of salumi and golden raisins lace this hearty polenta pie, a specialty of the pre-Roman town of Teramo in Abruzzo. Be sure to use regular, not instant, polenta, or the pie will not cook properly. If serving as a main course, accompany with a salad or green vegetables. Preheat oven to 375 degrees. Oil or butter a 12-inch pie dish or a 9-by-12-inch baking dish. In a large sauté pan, warm the 2 tablespoons olive oil (or melt the lard) over medium heat. Add the pancetta and cook, stirring occasionally, until it renders its fat and is cooked through but not crisp, 5 to 7 minutes. Remove from the heat. 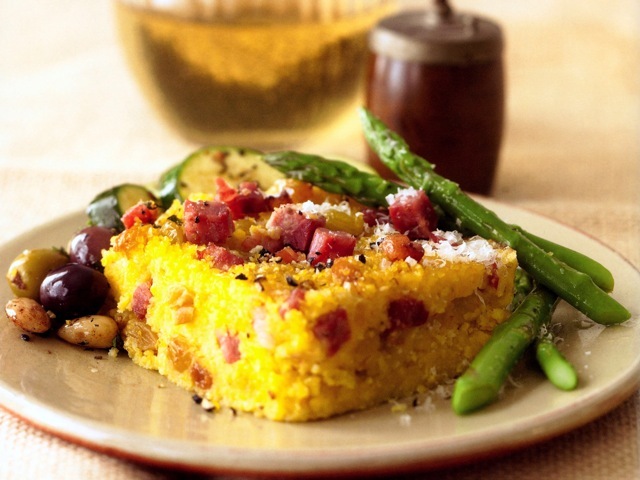 In a large bowl, combine the polenta and salt. Gradually whisk in enough boiling water to make a very thick batter. Add three-fourths each of the pancetta and sopressata, the raisins, the egg yolks, and some pepper and mix well. Pour into the prepared dish. Top evenly with the remaining pancetta and sopressata and drizzle with a little olive oil. Bake until the top is golden and the pancetta is crisp, about 40 minutes. Let cool for about 10 minutes before serving.